The popular pizza takeaway joint Pizzaface will offer you an array of pizza options from vegan, non-veg and gluten free varieties along with salads, sides, desserts and drinks. 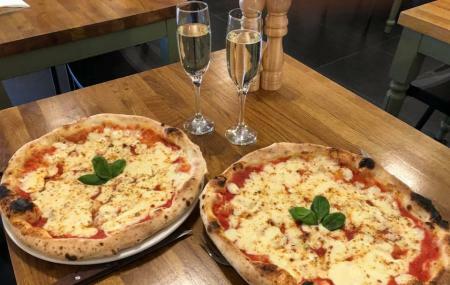 Their pizzas are made with fresh vegetables, fresh and high-quality meats and Sardinian “oo” flavour and baked in a stone oven at 300-degree temperature. Starting in 2009 with small resources, Pizzaface is now one of the most sought-after food joints in the area. Their special pizzas include Cascade Veggie, Meathead, Proper Ham and Pineapple, Parma and Holy Cheese while the Vegan dishes include The Moby and Thom Yorke. Garden Salad, Meatbox, Coleslaw and Stuffed Portobello Mushrooms are your side dishes. Enjoy desserts like Choc Cherry Sorbet, Sea Salt Caramel and Miss Muffin Top Brownie and drinks like Sottano Malbec, Domenico De Bertiol Prosecco, Falerio, Punk IPA, Rose Lemonade and Ginger Beer. Incredible pizza. Original topping with an excellent choice. Top quality and I'm not sure I've ever had such a good pizza before. Friendly staff and quick service. Decent vegan options if you're that way inclined. Try the vegan brownies too. My go to place for 🍕 was never disappointed and always over the moon with quick service and pleasant staff! The pizza here is so so so good! Vegan pizza is amazing but quite hard dough next day (so don’t save a portion for next day!). Service is good and they are always busy.